iTunes Sync not Working? Find Solutions Here! Why My iTunes Won’t Open on Windows 7 / 10 ? Why is My iTunes Library Empty After Update? How to Recover it? One of the features frequently used by iTunes users is syncing iTunes media to iPhone. However, it may become difficult to sync iTunes media without having issues. One common problem facing iTunes users is that iTunes gets stuck on the "Waiting for changes to be made" or "Waiting for items to copy" steps which can take hours. Several factors such as duplicate purchases or damaged item file can be responsible for iTunes not syncing. 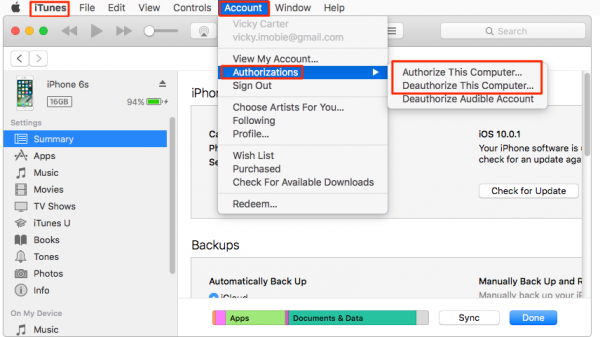 How to Sync iPhone with iTunes over Wifi ? iTunes Not Syncing All Songs? iTunes Won't Sync Music to iPhone? In this article, I am going to show you some methods on how to fix this headache for you. All you have to do is follow the instructions below. iMyFone TunesMate is one of the best alternative for iTunes. 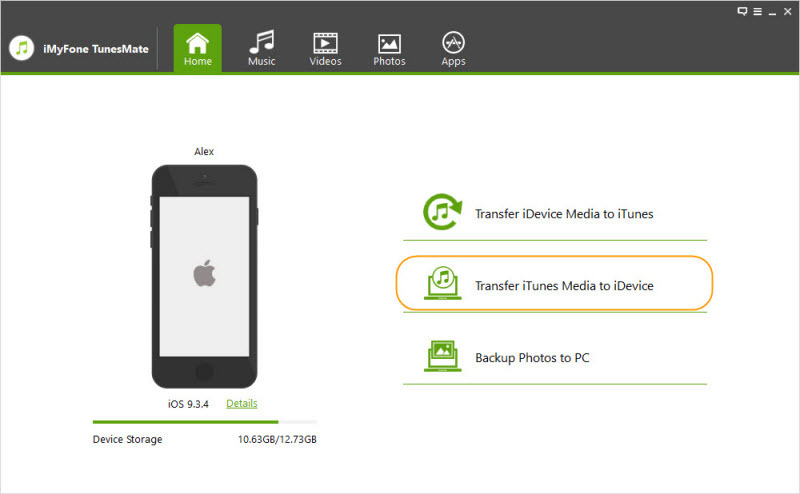 It can sync media files from PC/iTunes to iPhone conveniently. All you have to do is install and launch the app on your PC and sync your media files with it. This application is handy because it supports every media file type and it allows you to manage and transfer your music and videos formats the way you want. Sync media files from new computers/iTunes libraries (unlimited) to iDevice without data erasing. Sync media files from iDevice to new computer/iTunes library, both purchased and free music are included. Support to sync music, movies, playlists, music videos, audiobooks, podcasts, iTunes U, TV shows, photos etc. 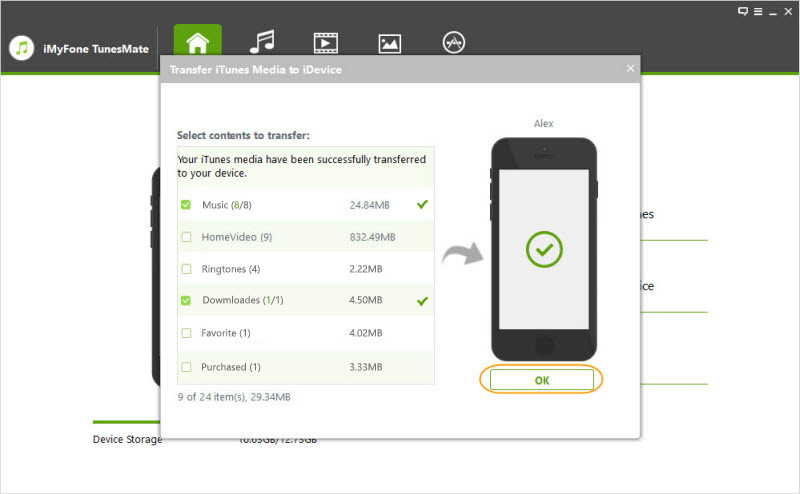 You can preview the media files and transfer them selectively. With iMyFone TunesMate, you can avoid iTunes not syncing issue. To use it, follow the instructions below. Step 1: Download, install and launch iMyFone TunesMate on your PC. Connect your iDevice to computer. Step 2: It will remind you to trust the computer on your device. 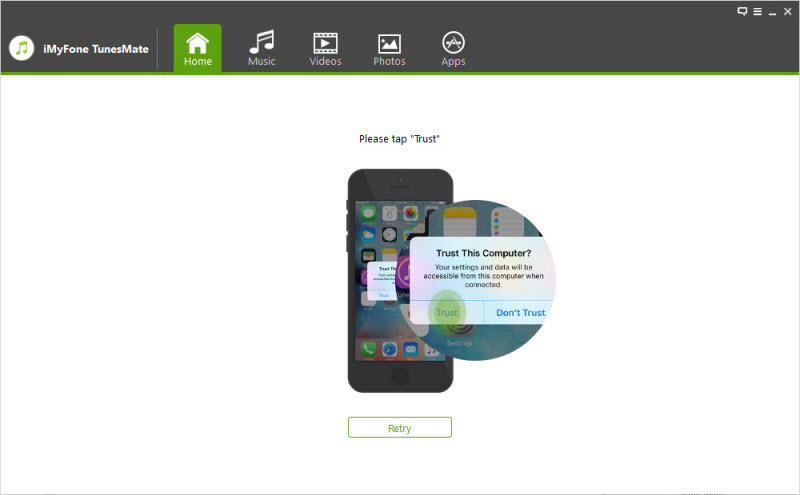 Tap on Trust, once done, iMyFone TunesMate will get access to your device. Step 3: After connecting, go to the menu and click on the "Transfer iTunes Media to iDevice" at the home interface. It will scan all the media files in your iTunes library and show them in a list. Step 4: The entire iTunes library will be selected by default, just check the files you want to transfer. Step 5: Click on Transfer Button to begin transfer, once done, click on OK. Step 1: Go to Settings > General > iPhone > Storage. Step 2: Then you can now find how much space you are left with under the storage outline. If you to have enough space to sync your iTunes media, then you need to free up space by getting rid of unnecessary files. 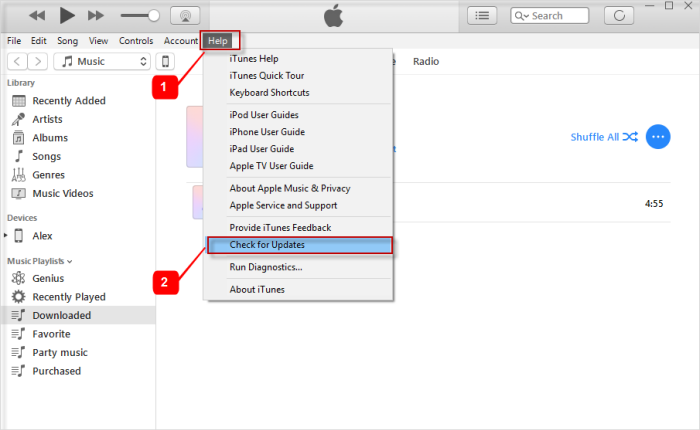 This method is useful for iTunes not syncing. This may sometimes be the reason why you are finding it difficult to sync your iTunes media to iPhone. In this case, what you need to do is just to update the app to the latest version. You can get updates from the Apple store. Step 1: Launch iTunes and click on Help. Step 2: Here you will find Check for Updates, click on it and start updating. Sometimes iTunes sync not working can be fixed by rebooting your device. You need to ensure that you have disconnected your iDevice from your PC before you reboot. This can be done by holding the sleep or wake button until a slider appears on the screen, then slide it to turn your phone off. Again, hold the sleep/ wake button for your iPhone to turn back on. Once your iPhone is on, connect it to your PC then try to sync it with iTunes once more. Step 1: Open iTunes and click on Account. You will have to input your Apple ID when asked. After finished, try to sync again to see whether it can sync normally or not. Being unable to sync iTunes media to iPhone can be certainly annoying; however, there are many solutions. Your best option is to probably use a device manager such as iMyFone TunesMate since it gives you a lot of freedom and it is very stable.